Brian Clough has given his support to the under-pressure Leeds boss Terry Venables. Speaking on BBC Radio Five Live (December 7th, 2002), Cloughie said Venables needed more time to get it right. Old Big 'Ead was speaking from experience. He spent just forty-four days as manager of United, before being ousted in a deal which he admits gave him vital financial security. Said Clough: "I'm surprised things haven't gone a bit better for him, but he's only been there five minutes and if you think a man has ability, as I think Terry has, then eventually in time it will come out." Cloughie's son Nigel appeared alongside the Master Manager at a special book signing (December 4th, 2002). The pair met fans at a bookshop in Burton, the town where Nigel is player-manager of the local club, Burton Albion. A week earlier Clough Senior had watched his son score a penalty in the FA Cup replay against Oldham at Eton Park. Although Nigel scored, the Brewers lost in a penalty shoot-out. Before the match, Nigel told Sky Sports it was difficult to be compared to his father. He said: "When I started playing in a similar position to him, he was always quick to mention the fastest 250 league goals he scored, a record which is still unbeaten. Then when I went into management, you realise you're not going to quite achieve all the things he did....because he reminds you so often!" A number of extra book signings have been announced in the run-up to Christmas. The Great Man will make several personal appearances, so fans can meet their hero and have a book signed. The Master Manager signed more copies of his latest book when he visited Eton Park to watch Burton Albion (November 23rd, 2002). Fans approached Cloughie in the stand at half time to ensure they had their copies signed personally. Wearing an overcoat on a cold afternoon, Brian watched his son Nigel string together some excellent passes, although the Brewers were beaten 2-0 by Woking. The England coach Sven Goran Eriksson has sent the national team into freefall, according to Cloughie. He says that after a bright start, Eriksson is to blame for England's dismal displays since last summer's World Cup. "I've been off the booze for more than six months now. Strict doctors' orders. The only times I've been tempted were when I was watching England against Slovakia and Macedonia. If I ever go back to the bottle, Eriksson will get the blame," Clough told The Sun (November 20th, 2002). Old Big 'Ead produced more classic quotes when he appeared as a special guest at a football forum at Pride Park in Derby. Cloughie was again in fine form as he answered questions from the audience. Referring to Sir Alex Ferguson and the number of European Cups both men have won, the Master Manager commented: "For all his horses, knighthoods and championships, he hasn't got two of what I've got. And I don't mean balls!" Clough also made his strongest attack yet on the FA officials who failed to appoint him as England manager. "I got the feeling that Lancaster Gate were frightened of me," he said. "As interviews go, I felt I had walked it. I had the experience required. But I didn't get it. They appointed Ron Greenwood and he wasn't even on the shortlist!" Raising his voice, Clough continued: "Ron Greenwood fitted the bill. Their bill. They weren't worried about the standing of English football in Europe. They weren't worried about gates. They were worried about themselves. They didn't want me invading and making waves. I should have had it. The timing was right." The evening had plenty of light-hearted moments too. He burst into song, giving a short rendition of "You've either got or you haven't got style". He then remarked: "And we've got it, haven't we?" The applause which followed showed that his fans had enjoyed every moment. The forum was broadcast on 106 Century FM (October 22nd, 2002) having been recorded three days previously. Brian Clough says his secret for success in derby matches was making sure his teams were relaxed. The Master Manager was speaking on the eve of the First Division clash between his two former sides, Derby County and Nottingham Forest at Pride Park (October 20th, 2002). In an interview with his former captain John McGovern, Clough told BBC Radio Nottingham he treated the preparation for a derby match like any other. "I used to take great delight, pleasure and pride in sending a side out to be prepared for every match," said Clough. "We found a formula. I hit on the idea very early-on that you couldn't send out a team which was nervous. Anybody who is nervous, whatever their walk of life, can't perform to the best of their ability. We knew we had the ability but I didn't want them freezing-up in the dressing room and not portraying everything they had." The record of forty-two league games without defeat, set by Brian Clough's Nottingham Forest, remains unbeaten following Everton's victory over Arsenal (October 19th, 2002). The Gunners had been closing-in on the record, but failed to beat it. Read Cloughie's previous quotes below. The Master Manager says he's still proud of the record set by his Nottingham Forest team which went forty-two games unbeaten in the league. Clough is now hoping that it won't be overtaken by Arsenal. "Ours was a magnificent achievement at any time in football and I don't think it will ever be beaten, " he told the Daily Express (October 5th, 2002). "I know Arsenal are pushing us for it at the moment, but I want our record to stand forever." Clough continued: "Martin O'Neill and John Robertson were playing for me then and whenever I bump into them, which I do from time to time, they always remind me of the record. The first thing they say when they see me is, 'Gaffer, out of everything we won, that record is the most valuable to us.' It is to me as well." Forest's record run started in November 1977 and ended in December the following year. The Great Man had a silver salver made to commemorate the record. It is engraved with all the results. "That's how much it means to me. Hey, and tell Arsene Wenger that I want to keep hold of the record please," added Clough. The former Reds striker Garry Birtles points out that Clough assembled his team without spending pots of cash like Wenger. "Brian Clough cobbled together our team of nearly unknowns and has-beens and turned them into a side that conquered Europe. Arsene Wenger is a top-class manager, but he's spent over £50 million to build this squad. If Brian Clough had that sort of money, I shudder to think how successful we would have been." Old Big 'Ead says he spends more time talking about football with his eldest son, Simon, than with Nigel, the player-manager at Burton Albion. The Master Manager also revealed how he hates watching football on television on his own. Speaking on 106 Century FM (September 20th, 2002) he said: "I have got a lot of things in common with Simon. So, if I have any knowledge to impart or any opinions, Simon kops for it. Then he gives his opinion and you get what I describe as a good footballing discussion." Clough continued: "I hate watching football on television on my own. The next worst thing is watching with my wife there, because she is not interested in football at all. I find that I'm talking to myself while she is reading a book. I will say 'that's never a corner' and she'll say, 'what's a corner?' So, I get on with our Simon and I don't tend to push any views on Nigel very much." Brian was appearing on a phone-in on Century and was once again on top form. When talking about changes in football over the years he said: "They call it progress and improvement. It's like this radio studio. The equipment is much better than the studios when I started in management. But the coffee's still rubbish." He also said he had watched the Middlesbrough-Sunderland match while visiting the North-East on his book-signing tour. He said he was impressed with Boro's performance. The Master Manager's book "Walking On Water" has become a Number One Bestseller, leaping ahead of books about Elvis Presley and John McEnroe. The book tops the list of non-fiction hardbacks in the Mail on Sunday (September 8th, 2002), after jumping from eighth place. You can win a signed copy of the book in an exclusive competition on this website (Archive Note: competition now closed). Old Big 'Ead says it's time for Sir Alex Ferguson to knock some sense into Roy Keane. Said Clough: "It's got to the stage where Alex has to decide very quickly whether to remove the 'arm around the shoulder' approach...and wallop him! I only ever hit Roy the once. He got up so I couldn't have hit him very hard." Clough discovered Keane and made him a star at Nottingham Forest. Following Keane's well-publicised outbursts, the Master Manager told the Sunday People (September 8th, 2002): "I think Alex should threaten Keaney and say, 'If you don't put your house in order you're going back to Cloughie for a month.' That'll make him bloomin' think." The sculptor who made the special bronze bust of Brian Clough has now created another collector's item. 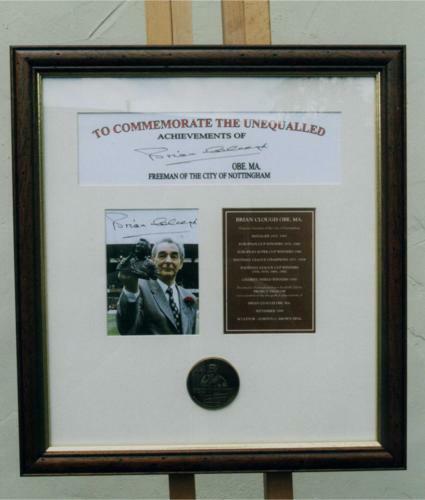 Gordon Brown has put together a superb souvenir incorporating a bronze coin and a picture of Cloughie. "It's a tribute to an outstanding man," said Gordon. Brian Clough has issued some timely advice for his son, Nigel, the boss at Burton Albion. Old Big 'Ead says it'll be a tough task for Clough Junior to continue being both a player and manager with the Brewers. "I keep telling him week after week, you can't do two jobs in football," says Clough. "Playing is hard enough and managing is even harder - and at thirty-six you're hardly a spring chicken!" The Master Manager was speaking to BBC Radio Derby during a special appearance at Pride Park to promote his new book. Hundreds of fans queued to see The Great Man and get their books personally signed (August 24th, 2002). Clough also had advice for Roy Keane. He told 106 Century FM that Keane should apologise to the Republic of Ireland manager Mick McCarthy following their World Cup bust-up. Said Clough: "If he's man enough to cause a lot of trouble, he is man enough to say I was wrong, I apologise and can I have another chance? Then the manager, if he's a reasonable fella, will say yes, I'll give you another chance." Old Big 'Ead was cheered and applauded by fans as he appeared at a special signing session for his new book (August 17th, 2002). Hundreds of fans turned-up to see their hero and have their books personally signed by The Great Man. The Master Manager presented one lucky couple with a bottle of champagne after they queued for nearly five hours to see him. "You're trying to get me back on the bottle, aren't you?" Clough joked as he handed the gift to Marcus Alton and Sarah Clarke. Cloughie was in fine form as he continued: "I used to bathe in this stuff and have a glass or two when we won." Marcus told him he was looking well, to which he replied: "I'm feeling well, son. I've got five grandchildren...and they run me ragged." Fans had broken into spontaneous applause when The Great Man appeared in the main entrance of the Asda supermarket in West Bridgford. They then began singing his name. He smiled and soaked-up the adulation as the memories of the glory days flooded back. It was the first of a series of signing sessions around the country. For more details, see below and follow the link to the book page. The Master Manager has admitted that doctors have told him to stop drinking, or he could die. Brian Clough also revealed he was having "on-going treatment" on his damaged liver. He speaks for the first time in depth about his drink problem in the new autobiography, "Walking On Water" (see below). Says Clough: "They used to say I could walk on water when I was in my pomp as a manager, but how I wish my career hadn't ended the way it did. Walk on water? I know most people out there will be saying that instead of walking on it, I should have taken more of it with my drinks. They are absolutely right." Old Big 'Ead says drinking impaired his judgement and worried his family. But he says he now knows he must never touch alcohol again. "I'm dealing with my drinking problem and I have a reputation for getting things done." The book is being serialised in The Sun newspaper, which used quotes from this website to illustrate some of the Master Manager's classic comments. More proof that this is the number one website for Clough news, information and tributes. Brian Clough has written a new fascinating account of his life, called "Walking On Water". It will be officially published on August 19th, 2002. He is expected to attend a special signing sesion in Nottingham two days before. In the book, published by Headline, he will speak out on many issues he has never addressed before. The Master Manager talks fully about his battle with alcohol and how he has found "a new calm" since he retired from management in 1993. Old Big 'Ead will also reveal how he achieved such outstanding success during his career, as well as giving more outspoken views on the state of the modern game and the current crop of managers. The first signing session will be held at the Asda supermarket in West Bridgford, Nottingham. Many fans are expected to turn-up to meet The Great Man on Saturday August 17th, 2002, at 11.30. The events co-ordinator at the Asda branch, Gail Smith, told this website: "We're really looking forward to meeting Mr Clough. It will be a very special occasion. It's another chance to pay tribute to a remarkable man." The Master Manager has praised England's famous 1-0 victory over Argentina in the World Cup. He said the win was vital following the team's "awful performance" against Sweden in the opening group match. Clough told The Sun (June 8th, 2002): "They looked a different team entirely, individually and collectively. So much so that they looked a better side than we realised we had. Every ingredient for baking the perfect cake - and every mouthful tasted beautiful." The Master Manager has backed the decision to send Roy Keane home from the World Cup. It follows the row between the Republic of Ireland manager Mick McCarthy and Keane, the team captain. Clough, who discovered the raw 18-year-old and signed him for Forest, told The Sun (May 28th, 2002): "He will always be remembered as the bloke who got himself sent home from the World Cup....if I was in Mick McCarthy's shoes, Keane would have to apologise on his hands and knees at my feet and beg to be accepted back into the squad...you can't have one player trying to run the show." Clough also recalled the time he sent Keane home from a foreign trip after the player allegedly misbehaved. "When I heard about it I sent him packing," he told the Sunday Express (May 26th, 2002). "He was going home because no one played the big-time Charlie at my club." Clough added that Keane was a superb footballer. "I have always rated Roy as arguably the best midfielder in the Premiership, if not the world. The lad is that good." As England prepare for the World Cup Finals, Old Big 'Ead has again been reflecting on how he missed out on the top job. He says he told the FA interview panel too much. "If you're good at the job, then flaunt it. I certainly did, possibly to my detriment," he told the May edition of Four Four Two magazine. "I missed out on the England job because I told the FA too much they didn't want to hear. It was important to me never to be frightened. If you are, then you send out frightened teams." Brian Clough says he's pleased to see Graham Taylor back in football management at Aston Villa. Old Big 'Ead says he admires Taylor's knack of getting the best out of his players and his ability to smile in the face of adversity. Clough told the April edition of Four Four Two magazine: "I'm delighted for all grandads that Graham Taylor is back in top-flight football as a manager. He had a great sense of humour when we used to line up against each other as managers - he needed it with some of the donkeys he had at Watford." Old Big 'Ead watched his son, Nigel, set-up Burton Albion's winning goal during a league match over the Easter Weekend. The Master Manager sat in the stand at Eton Park as the Brewers beat Colwyn Bay 1-0 in the Unibond League (March 30th, 2002). Nigel, the home side's manager, played for the full ninety minutes. Afterwards, Clough Senior faced a short delay in leaving the ground when he discovered two police cars had accidentally blocked-in his son Simon's car. But one of the offending vehicles was soon moved and a smiling Cloughie was driven away. Fans have voted for their favourite all-time quote by the Master Manager. The results of an on-line poll by this website are being released in the week the Great Man celebrates his 67th birthday (March 21st, 2002). There have been so many classic quotes to savour over the years. His appearances on radio and television and his columns in newspapers and magazines still produce gems. More than sixty per cent of voters chose the same classic quote. Find out what it is, and who has won a special Clough coin, on the Quote Vote page. Old Big 'Ead says football managers should take more responsibility for the discipline of their players. Clough, who was known as a strict disciplinarian during his outstanding managerial career, says players who regularly get into trouble should be shown the door. He tells the March edition of Four Four Two magazine: "Everyone makes mistakes but not consistently. There's no secret to all this - it's called management. The game hasn't changed all that much since I shuffled off into retirement. Most footballers are thick and they can't really handle the adulation and the money. It's up to managers to help them adjust to the lifestyle." The former Nottingham Forest, Derby County and England goalkeeper, Peter Shilton, has given his backing to this website's campaign to get a knighthood for Brian Clough. Speaking on a visit to the City Ground (March 4th, 2002), Shilton said the honour would be fully justified. He told BBC Radio Nottingham: "When you look at the people who have already received knighthoods, he definitely deserves one. The public like his plain-speaking. He always had very good values in terms of discipline and the way the game was played." Shilton, who played for Clough during Forest's European glory years, was visiting the city to launch a volunteering scheme for the over-fifties. The Master Manager offered his usual wit and wisdom when he appeared as a radio match summariser for Derby County's game against Manchester United at Pride Park (March 3rd, 2002). Clough was immersed in the exciting atmosphere, telling listeners to 106 Century FM that it was a fantastic match. He was full of praise for United's Ruud van Nistelroy, who collided with the Rams' keeper Andy Oakes in the opening minutes. Said Clough: "He was brave. He didn't look for the goalkeeper, he got his head to the ball. Is he a Dutchman? Considering the Germans got through Holland in ten hours, he was brave for a Dutchman." Clough also made a cheeky comment about a male streaker who ran onto the pitch - read his verdict on the Quotes Page. The Great Man has given his backing to Derby County's appointment of John Gregory as the new manager. Clough was at Pride Park to watch Gregory guide the Rams to victory over Spurs on February 2nd, 2002. He also saw Derby lose at home to his former side Sunderland a week later and shook hands with the visitors' manager, Peter Reid. Speaking on a radio phone-in (February 12th, 2002) about Gregory's chances of keeping Derby in the Premiership, Clough said: "Good luck to him. He's got the experience. He's also got a hell of a job on his hands." The Master Manager says he still keeps in touch with the former Forest player Martin O'Neill since his move to Celtic. "Martin will send an occasional postcard reminding me that I haven't been up to Scotland to see him," Clough told The Times newspaper (February 9th, 2002). In an article looking at O'Neill's transformation into a talented manager, Clough says: "Having spent the best part of ten years with me at Nottingham Forest, nothing will surprise him. When he first met me he thought I was nuts. When he left me, he was absolutely certain." Old Big 'Ead says Sven Goran Erikkson should take the England team on holiday to Majorca just before the World Cup Finals start this summer. "I'd sit them down on a beach with their loved ones and bairns and tell them to do nowt more strenuous than build sandcastles and down the odd glass of beer," says Clough. He also tells the February edition of Four Four Two magazine that Michael Owen will be vital to England's success. "Owen has come on so well that Sven must utter a silent prayer as he sits in his London mansion, humming along to his Abba records." The Master Manager has criticised the board of directors at his former club, Derby County, for parting company with Colin Todd. "Sacking someone after just ninety days in charge is ludicrous," Clough told The Mirror newspaper (January 16th, 2002). "The directors have got it all hopelessly wrong. The most important thing they ever have to do is appoint the manager. Colin Todd is the second one they have got rid of this season." Clough added that Todd's successor would face a tough task. "It will be difficult enough for the poor bloke to win a single match, never mind keep Derby in the Premiership. He will have an impossible job, an horrendous task." Old Big 'Ead was in fine form during another appearance on a radio phone-in. Referring to football directors who know nothing about the game, he said: "The only match they've seen is in a box of Swan Vestas." One caller thanked the Great Man after he gave Cloughie a lift and the Master Manager repaid the favour by sending some flowers and a get well card to the caller's sick wife. "Don't tell everyone, or they'll all want roses," joked Clough. He ended the session on 106 Century FM (January 8th, 2002) by promising to appear as a match summariser. "I'd like to add a little to your repertoire and experience," he said. "And by 'eck do you need some help." The knighthood campaign started by this website will continue, following the omission of the Master Manager from the New Year's Honours List (archive 2002). Fans know that he deserves the accolade far more than Sir Alex Ferguson. Recent coverage on BBC Radio Five Live proved he's the popular choice.